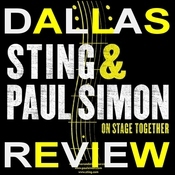 When Paul Simon and Sting took the stage together, they were each accompanied by their full bands, which often appeared on the stage with them at the same time throughout the set, working together to create an even more lush and almost orchestral version of songs they performed together. To introduce us to the concept of them both working together in what seemed like perfectly natural synch, the two opened the show with Sting's song "Brand New Day." Right off the bat, the chemistry between everyone involved was readily apparent, and both Simon and Sting sang with palpable relish. Songs that both men have sung across decades never seemed stale; in fact, they came off lively and even spirited. What was most interesting was the way in which Simon and Sting complemented each other; as singers, their tonal range is similar, but their style differs considerably, and yet it really worked. Together, their voices together gave an emotional power and heft to already solid songs. This synergy most powerfully manifested, somewhat unexpectedly, in "Fields of Gold," which concluded what could be considered the introduction of the show. With the bands seamlessly working together and the singers harmonizing like lifelong collaborators on a song probably heard most often these days in dentist offices, it seemed so vibrant and vivid. Yet with its original subtle shades of sonic texture, it was almost like a new song. But the show wasn't all collaborative; over the course of roughly two hours, Simon and Sting each also played individual sets. In his first set without Simon, Sting started things off with "Every Little Thing She Does Is Magic," a classic from his years with the Police and a real crowd pleaser that inspired a massive sing-a-long from the crowd. At one point, Sting told us that in his career as a musician it was his ambition to write a country song but that there was a problem: that he was English -- and not even from the south of England but the north. Just same, he noted that Johnny Cash had covered one of his songs and that he would perform that song, "I Hung My Head," in a style akin to country. 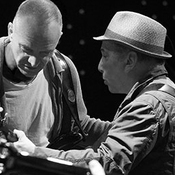 Following an energetic turn of "Driven To Tears" in which the violin player took a brilliant and frenetic lead part that was played on guitar on the Police original, Simon came back on stage and joined Sting and company for "Love Is The Seventh Wave." For his own first set without Sting, Simon went right into some fan favorites beginning with "Mother And Child Reunion." Simon's band was obviously very well rehearsed, but it was impressive the intuitive way the group played together, particularly how they could go off script a little and still stay in synch, performing the songs with fluidity and freshness. "Me And Julio Down By The Schoolyard" got a lot of people dancing, as it should, as did "50 Ways To Leave Your Lover" and "Graceland." To close out the solo set, Simon and his band covered "Pretty Thing" by Bo Diddly and put some enthusiasm into it. Afterward, Sting and his band came back on and he and Simon did a stirring duet of Sting's "Fragile." Then Sting told Paul Simon he should leave the stage so he didn't get embarrassed. When Simon was gone, Sting told us that he was honored to share the stage with someone like Simon, a guy who wrote songs that pretty much anyone could hear and relate strongly to like a story out of your own life. Sting then told us he was going to play a song that reminded him of the first time he came to America in his mid twenties on tour with the Police, which included a stop at Rainbow Music Hall (Sting joked that three people were there, and two of them were roadies). He and the band then performed Simon & Garfunkel's "America." "Message In A Bottle" got most of the crowd singing along with the chorus, and the song seemed generally imbued with a new life, especially with Sting, clearly in good spirits, performing it like he rediscovered a love of the music from across his career. "The Hounds of Winter" was both dark and striking, as was the majestic "Desert Rose." And, naturally, "Roxanne" elicited some of the most enthusiastic dancing of the whole show. Simon and Sting performed "The Boxer" together and added layers of vocal subtlety to the song that just made it seem even better than it already was. Simon then took his second solo section of the evening and got things going with an interesting choice of the Zydeco-inflected "That Was Your Mother." Back to back, Simon played an effective cover of a Junior Parker classic, "Mystery Train," and a zestful take on Chet Atkins' "Wheels." He followed this with some heavy hitters from his catalog with "The Obvious Child," a virtually theatrical take on "Diamonds On the Soles of Her Shoes," and the big hit of the night, "You Can Call Me Al." Sting came back for the closing act of the show, and the two men sang "Every Breath You Take" together. Some of us have heard that song ad infinitum over the last thirty plus years, but with the two singers bringing out the inherent possibilities of the song, it felt like a reminder that it really is great pop song. The main set closed with "Bridge Over Troubled Water," with Simon and Sting taking turns with the verses and then the two coming together in the end for the iconic song. Most everyone left stage at the song's conclusion, but the lights didn't come up right away, and both Simon and Sting came back on with acoustic guitars and were accompanied by a Simon's drummer and his electric guitarist. Simon told us it was a song written by his dear friend, the late Phil Everly. The tune ended up being a loving rendition of "When Will I Be Loved." It was a nice personal touch and a great way to end the show. For more reviews from the Denver show please visit http://www.sting.com/tour/index/date/id/2913 where you can view the setlist, leave your comments about the show, post images of your ticket stub and your photos from the show!